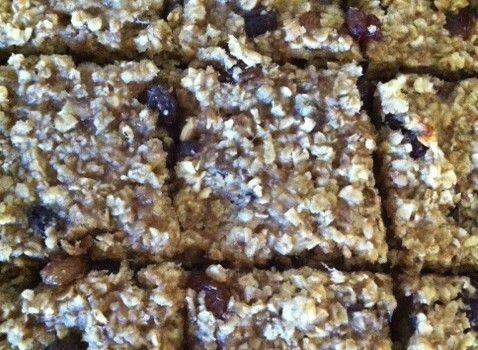 This recipe is one of our family favs and I love the fact that although it’s a flapjack it’s not full of syrup. My toddler girl loves cooking with me and this is a recipe that she can really get involved with, here’s some photo’s of her doing so from an earlier post. In a separate bowl weigh out honey and marg, then melt, if you prefer a sweeter option you could add a little brown sugar too, I don’t (I heat in the microwave for 40 seconds). Mix all the ingredients together. I tend to find that a lot of the sultanas end up in small persons mouth whilst the mixing process occurs! Place into a greased tin and bake at Gas Mark 5 for 30 mins. You may want to cover the top for half the cooking so the sultanas don’t burn. 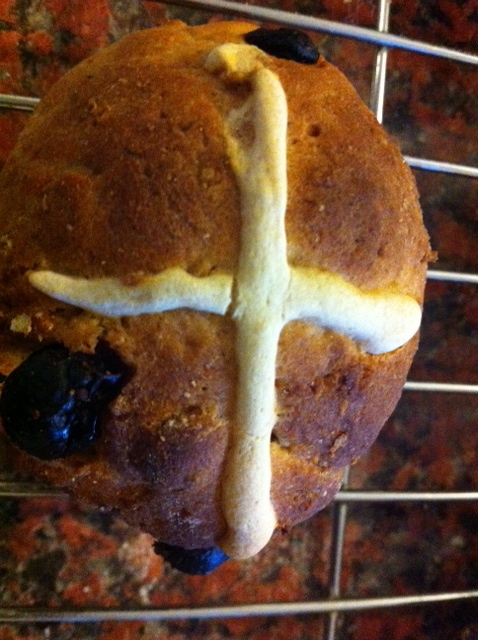 Slice whilst it is warm and leave to cool before removing from the tin. 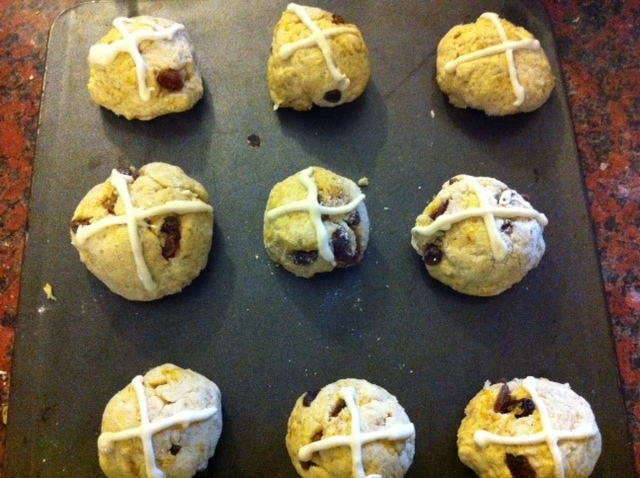 Wheat Free, Hot Cross Buns. I’m certainly not an experienced baker at all….yet I love giving things a go. 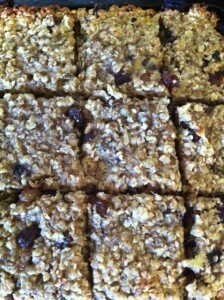 Plus when you are wheat intolerant it can be cheaper to make things yourself rather than buy them. So in the back of my mind I had planned to try making some hot cross buns in the run up to Easter. 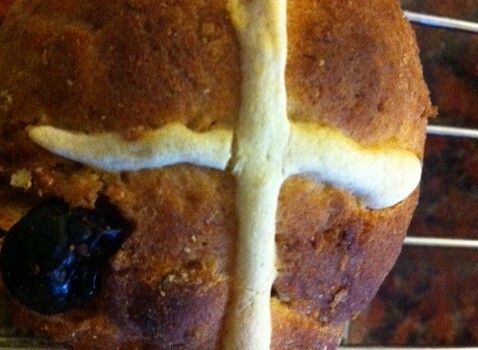 Typically life ran away with itself, time fly by and on Easter Sunday there were still no hot cross buns. 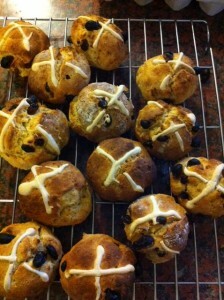 The final result, Hot Cross Buns. Mix all the above together to make a dough, but don’t knead it. Then place into an oiled bowl, cover with cling film and leave to rise in a warm place. This took about 1 1/2 hours for mine. It should almost double in size and it feels risen to the touch, springy and doughy. Pop in the oven at Gas Mark 7 for 20 minutes. I checked mine and swapped the upper and middle trays over half way through. Leave to cool on a wire rack and enjoy. Yum.